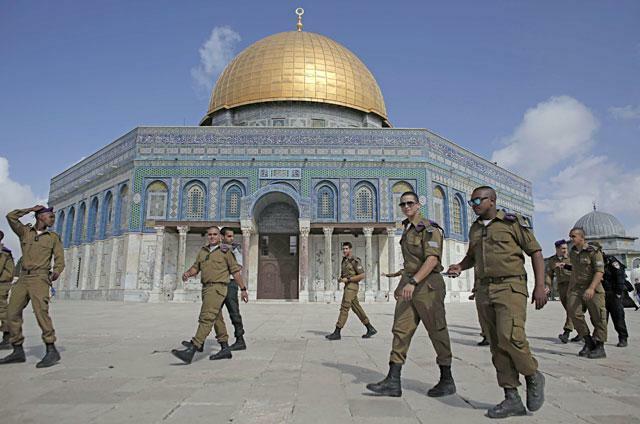 AMMAN — The government on Tuesday warned Israeli occupation authorities against its recurrent attacks on Islamic awqaf employees and Al Aqsa Mosque. Awqaf Minister Abdul Nasser Abul Bassal, in a statement carried by the Jordan News Agency, Petra, warned against the increasing number of break-ins at Al Aqsa Mosque. The Israelis are playing with fire, he said. Citing 5,000 raid incidents in 2005, Abul Bassal added that occupation forces and settlers carried out 30,000 raids in 2018. The minister also warned against flying of gliders over Al Aqsa Mosque, and the occupation authorities’ infrastructure committee’s decision to build a cable car in the old city of Jerusalem, linking Jabal Al Zaytoon to the Buraq Square. He also condemned Israeli renovations on the southern part of the mosque’s Western Wall, underneath the Islamic Museum, while the Al Aqsa Mosque Reconstruction Committee is banned from undertaking rehabilitation works at the site. This is blatant interference in the work of the general administration of the Jerusalem Awqaf Department and the Al Aqsa Mosque Reconstruction Committee, he said. He also added that these measures stipulate dangerous infringements against the law and Al Aqsa Mosque’s legal status, in what he described as attempts to control the mosque and alter the status quo. Abul Bassal expressed his utmost rejection of these provocative practices and the attacks by extremists and extremist ministers, Knesset members and military personnel, who enter the facilities of the mosque by force of arms. These acts provoke the feelings of the faithful and Muslims all around the world, he said, calling on the Organisation of Islamic Cooperation, the Arab League, Arab and Islamic countries, UNESCO and relevant international organisations to pressure Israeli escalatory measures and attacks against Islamic and Christian holy sites in Jerusalem to a stop. He also called for supporting Jordan in the face of Israeli aggressions that, if continued, will take the region to a religious war that His Majesty King Abdullah has always warned against.